MyHeritage announced that they had surpassed 8 billion records on SuperSearch. That’s a lot of records! 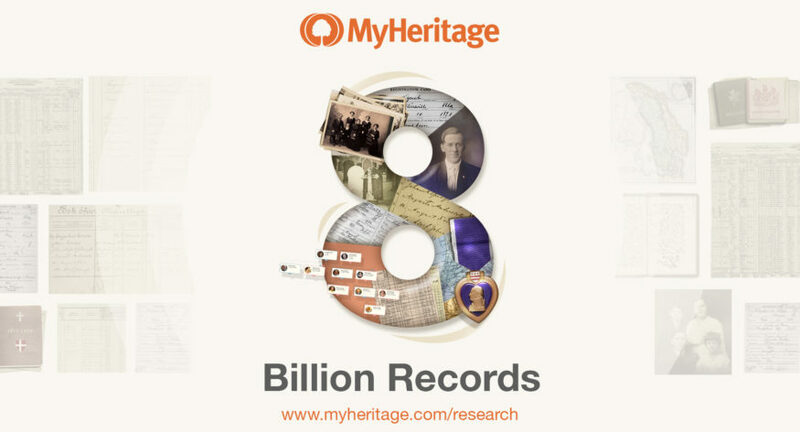 MyHeritage shared insights on how they count records and where to find those records. In May of 2017, MyHeritage introduced their Collection Catalog. It is a section on the MyHeritage website that lists the historical record collections that are available on SuperSearch. Collection Catalog details the number of records each collection contains, points out which collections are new, and shows the date that each collection was added or last updated. Each collection of historical records in SuperSearch includes a precise record count. This helps MyHeritage to count their number of records. In structured collections, such as census records, birth, and marriage records, each individual name is counted as one record. In short, a marriage document that has the name of both the bride and the name of the groom counts as two records. Nicknames or aliases are not counted as additional records. In family trees, each profile is counted as one record (even when it is available in more than one language.) Each photo counts as one record. In unstructured records, like newspapers or yearbooks, each page is counted as one record. You can find records on MyHeritage in a number of ways. One way is their Record Detective technology. It will suggest additional records that are relevant to the person whose record you are currently viewing. MyHeritage’s Global Name Translation technology automatically translates names found in historical records and family trees from one language into another. SuperSearch alerts are notifications that let you know when new results are available for your previous searches on SuperSearch. Those notifications are for records that did not exist when you originally conducted the searches.